How to make wedding bouquets is a skill that will need some practice, this is not something that you want to leave until the last minute! However there is an emergency bouquet idea at the end if your practice goes a bit wrong! Think about the flowers that you want to use and the colors that will fit with your theme. Roses work really well as they are fairly hardy, they will withstand some handling and their stems are nice and strong. Your bouquets should have an odd number of flowers as this will look best and will stop the bouquet looking like a clock face. Also think about the foliage that you want to use as this will help hold the bouquet together. But most important is to keep it simple! As well as the flowers you will need; string, florist tape, ribbon, string, pins and wires. The equipment you will use are scissors and secateurs. If you are making your own bouquet to save money you need to add up the costs for making your own and compare them. Don’t forget to double the cost of flowers that you will need for your practice bouquet. 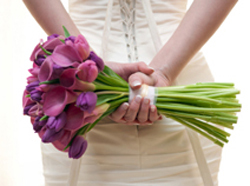 If the costs are still less then take a look at this great video on how to make wedding bouquets. You can also use silk flowers for your bouquet, this is a good idea for a destination wedding where you want to take your own flowers or if your flowers might wilt in the heat. Another advantage is that you can prepare them weeks in advance! If you are using fresh flowers then you can make your bouquet the night before and keep it in a bucket of water in the fridge. Make sure the water does not touch the ribbon. You could also make smaller bouquets in the same design for your bridesmaids, or get them to come over and you could all make your own! If however it all goes a bit wrong and your bouquet doesn't turn out quite how you wanted it to, there is a big cheat you can do. And that is using the great bouquets you can now find in all the big stores. You may want to have a look before hand to find the store with the flowers that you love the best. Choose a bouquet that you love, take it home and take all the cellophane and paper off, but leave the stems all secured together. Next take some ribbon and wrap it around the stems and that is it! Not bad for an emergency! How much will your flowers cost?